Our day started with clear skies and beautiful sunrise. Just like yesterday, we got up (or should I say got out of the room, as we don’t sleep!) early to enjoy the sunrise before we head to Lobuche. For some reasons, those infamous 7 steps going up the trail didn’t feel as strenuous as yesterday, I guess I am getting used to the altitude. 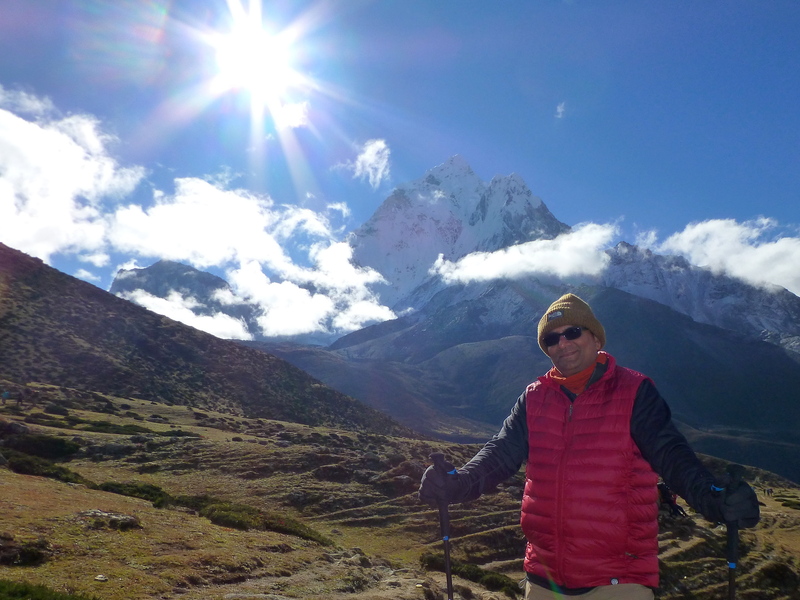 The sky was spotless – no clouds and the golden light of rising sun on Ama Dablam was magical. Unfortunately, photographs do not do justice to these scenery. 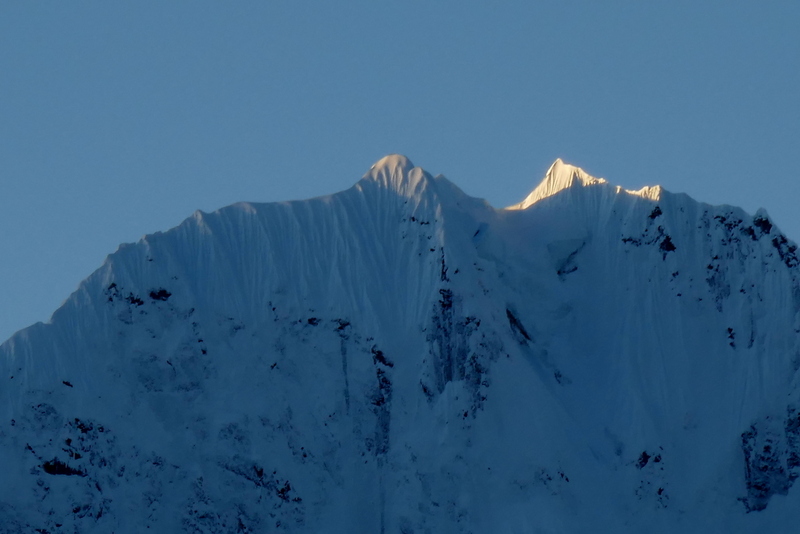 Early morning sunlight on Himalayan mountains. 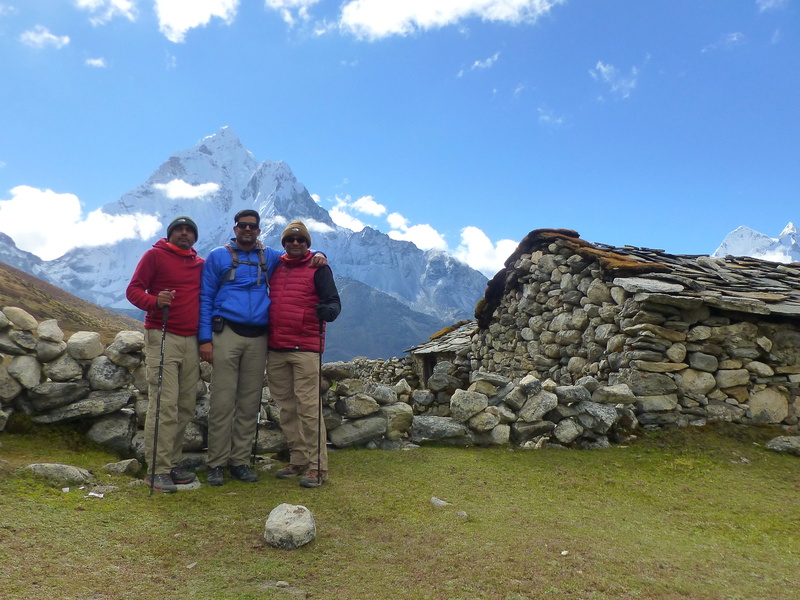 Deepak and Bahadur, our two porters are ready! We left around 7:15 am after a hearty breakfast. The trail from our hotel goes up to the Buddhist stupa on a tall hill which seems to be a junction for several trails. 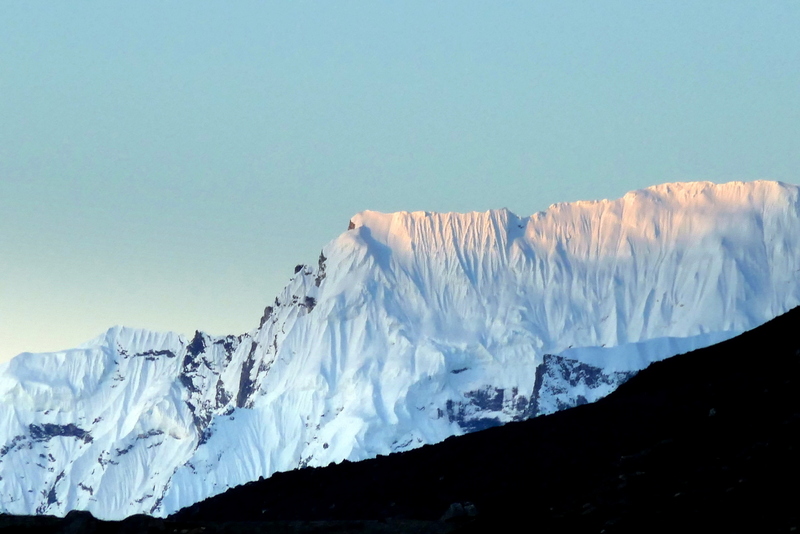 We passed by it on our acclimatization hike yesterday and Rush trekked there every morning to take sunrise photos. Both the stupas and Dingboche valley looked different in bright sunlight. Here is a beautiful picture of sunlit mountain behind the prayer flag – one of my favorite pictures clicked by Rush. Sunlit mountain behind the prayer flag. Dingboche. 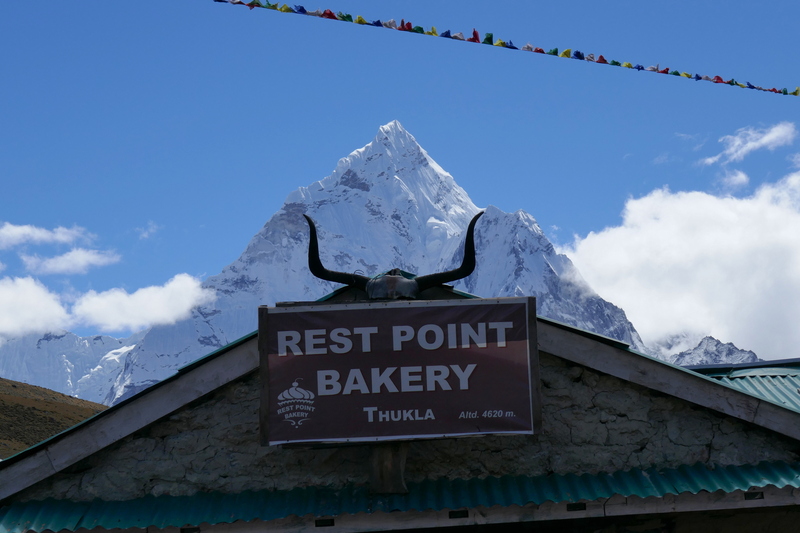 Our today’s hike from Dingboche to Lobuche was an introduction to what lies ahead. Gone are the suspension bridges, prayer wheels, scrubby bushes – we are now entering into the land of giant mountains, large plains, packed dirt, rocks, and zero vegetation. The trail becomes less defined, dry, and dusty in several areas. The towns become thinner and the amenities more basic. We walk along a river gorge on one side and mountains on the other. There was a group of British hikers doing the same trek and was more or less with us throughout the way. It was interesting to watch them hiking in a single file throughout the trek. After all they are Brits! I guess it helps to make sure all are together and avoid any trail pitfalls. A group of hikers in a single file. “Disciplined” hikers in a single file. The initial trek is comparatively flat and easy-going. We enjoyed this part of the trek in warm morning sun. Along the way, we stopped at many places to take photos. Stone house in a farm along the way. The trail leads a gradual incline up to Dhugla and thereafter about an hour or so steep ascend to memorial hill – a monument dedicated to many climbers who lost their life climbing Himalayan mountains. The initial trek was relatively flat and enjoyable. The trek up to the memorial hill was very difficult (I have been saying it for each day’s hike since Namche Bazaar!) – not sure if there is any better way to describe it. Two hours of steep uphill climb through winding switchbacks in bitter cold and wind.The spectacular views of the valley and mountains made it a little bearable. A view of the valley and mountains along the way. We see many hikers (including myself) struggling at times and taking frequent micro breaks. I guess that’s why some one decided to encourage all the hikers with the following message. I thought it was very cute and appropriate for this location, one of my favorite pictures from the EBC trek. Hope is still alive! . (c)SherpaValley. Prayer flags and mountains near Memorial. We get a relief after the memorial hill with relatively flat terrain and beautiful views of the valley. Along the way, we reach at a location where we took jumping jack photos with mountains and glaciers in the background that have become some of my favorite photos from the EBC trek. Jumping 3 to 4 feet up at this elevation was a ginormous task as it sucked last bit of energy from my body. 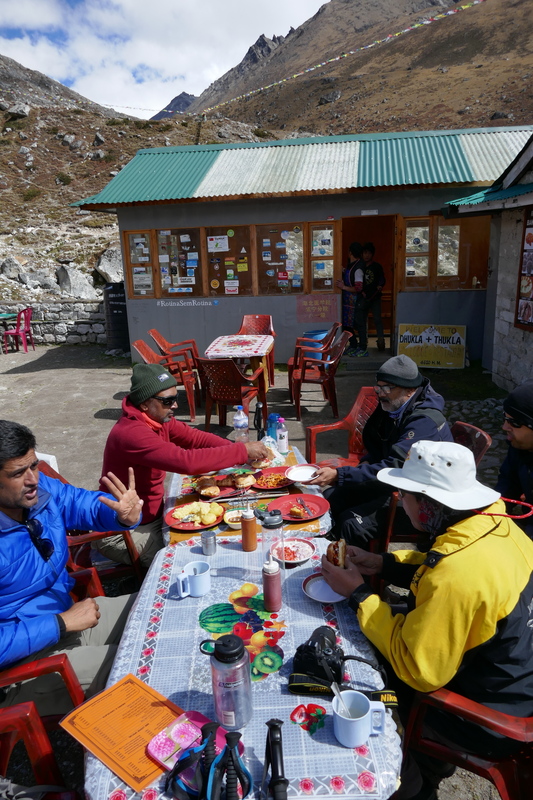 We reached Thukla, our lunch place in about 3 hours with many breaks. Varun posing on a bridge before Thukla. Thukla is a very small place with a cluster of 4 to 5 buildings – that’s it. There is a lodge, bakery, restaurant, and some small buildings for the residents. 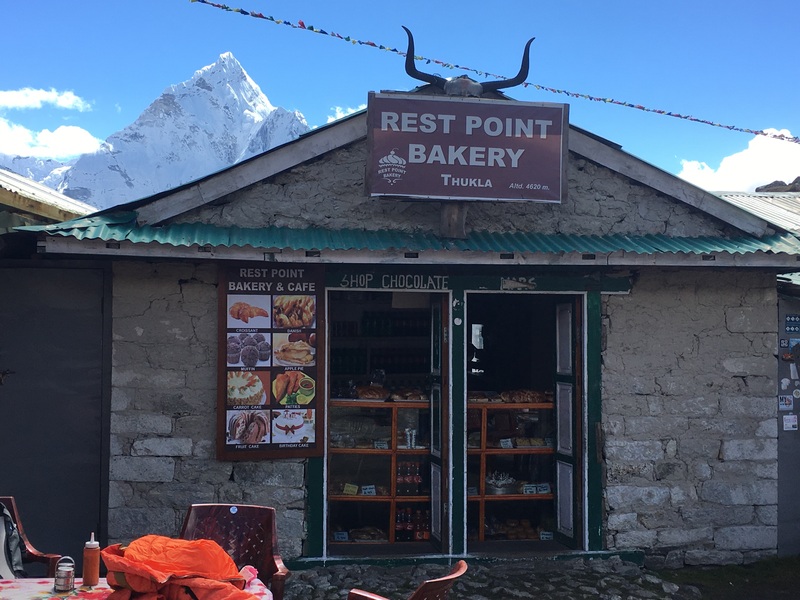 It was the smallest town I saw on the trail and pretty much everyone stops here for lunch as it is at a point on this trek when everyone is ready for Dal-Bhat power recharge. Also, there are no other places for lunch beyond this “town”. When I saw the Bakery advertising mouth watering items, I was excited to have some sugar fix. Unfortunately, they were out of pretty much everything except some dinner rolls so Kamlesh came up with a brilliant idea of making Dabeli (Indian Street Food) which was an instant hit. As I wrote earlier, I had brought many small gift items for kids from back home and carried some in my backpack and distributed some to others in my group. After Namche Bazaar, we started seeing less and less kids as we are now in remote part of the Khumbu valley. While waiting for our lunch (Boiled potato for Dabeli) Doctor explored around and found some kids and we happily distributed several gifts. Dr. Dipak with an adorable baby Sherpani at Thukla. 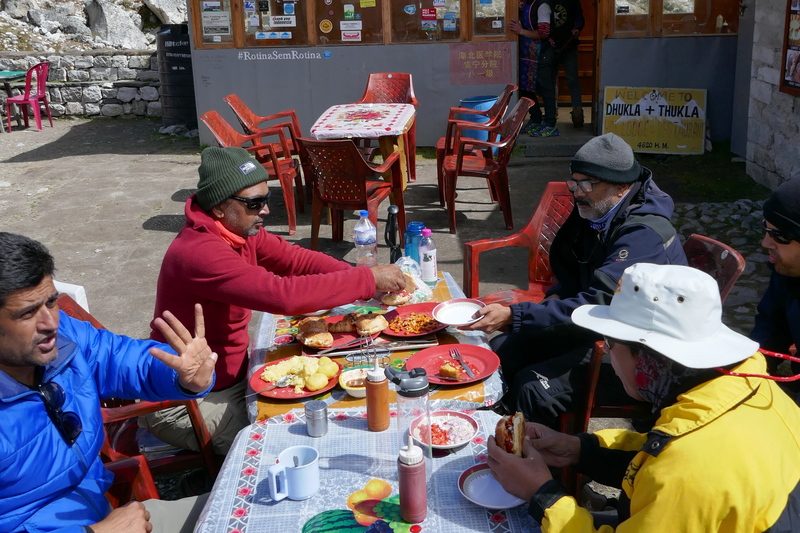 At Thukla, Manubhai ran into his Korean trail friends and exchanged some pleasantries (see behind Dr. Dipak in above photo). I noticed a young women seating inside the restaurant trying to take photos of her tongue to send it to someone via her phone for medical advice. It turned out that she noticed her tongue had a deep red/purple color and she was panicking that something was seriously wrong with her. I connected her with Dr. Dipak who took her vitals, examined her and confirmed that everything was OK with her. She was relieved to get some unexpected medical help. We started our trek after a nice and extended lunch. Along the way we confirmed that the Brits are still hiking in a single file. 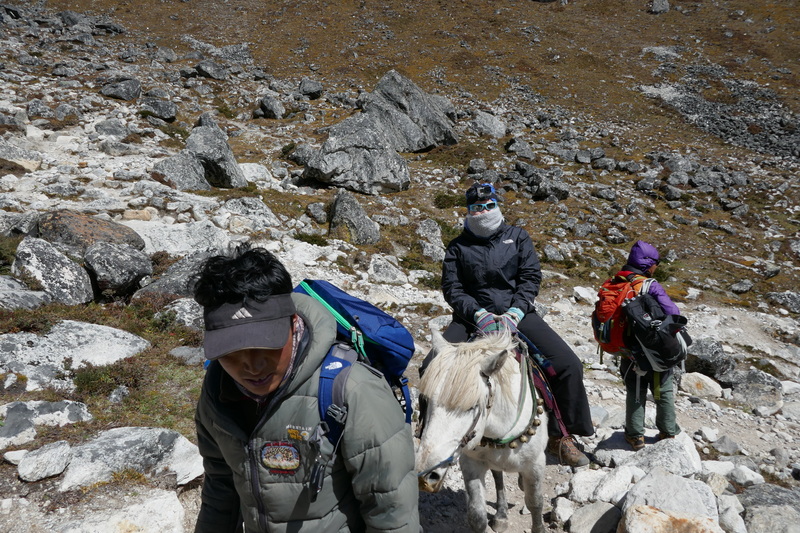 For the first time on the EBC trek, I saw a visitor riding a horse all the way to the EBC. 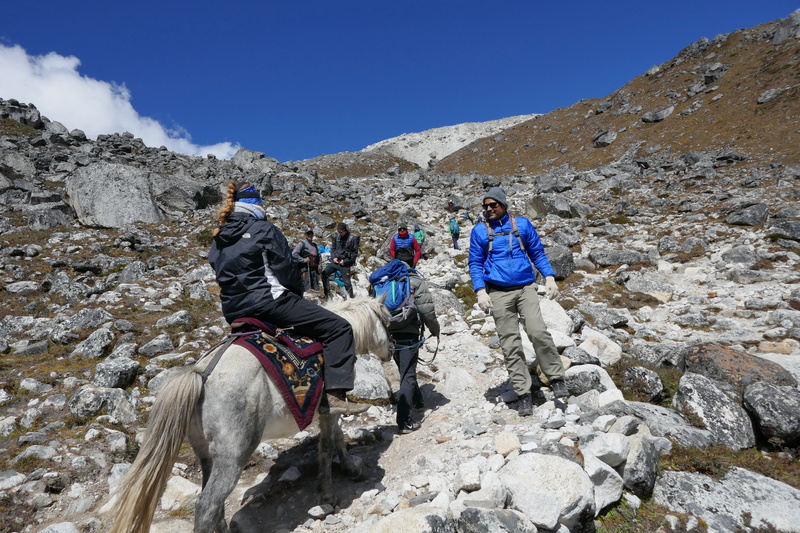 I have had seen signs for horse rental along the trek but my guide said it is generally for medical evacuation purpose (helicopters evacuation is not always possible – also expensive!). Rush asked how did it feel riding on a horse on this terrain and her reply was “great”. Later on, Kamlesh told me he overheard some one saying “have you asked the horse?” I am sure it was captured on her head mounted GoPro. As expected, it gets progressively colder and breezier as we approach Lobuche. The test of endurance starts from this trek and continue building up till you reach Kala Patthar. There were times where I started doubting my ability to successfully complete the trek, but as always it goes away as you reach the next milestone. All the hikers seems to move in packs, at times I witnessed Himalayan traffic jam on narrow passes or bridges, particularly when a train of Yaks or a group of hikers are coming from the opposite direction. Yak caravan coming from Lobuche. Dr. Dipak resting along the river. 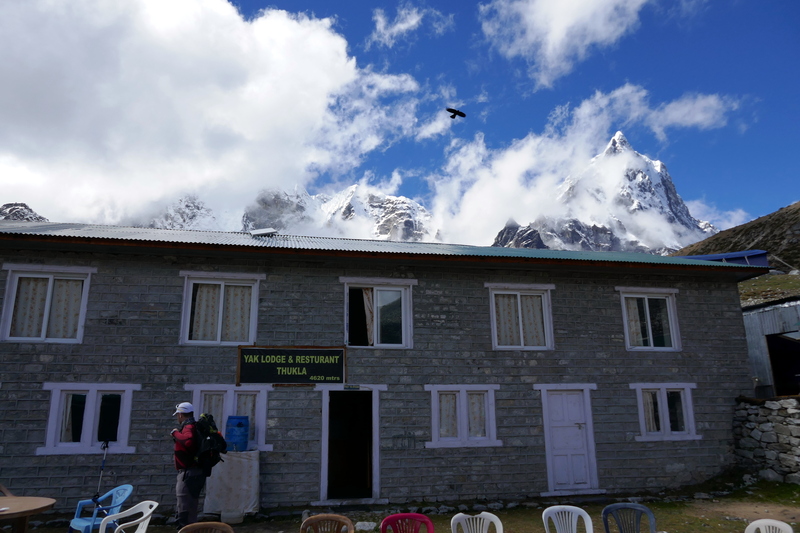 Solar heater with a tea kettle at Lobuche. 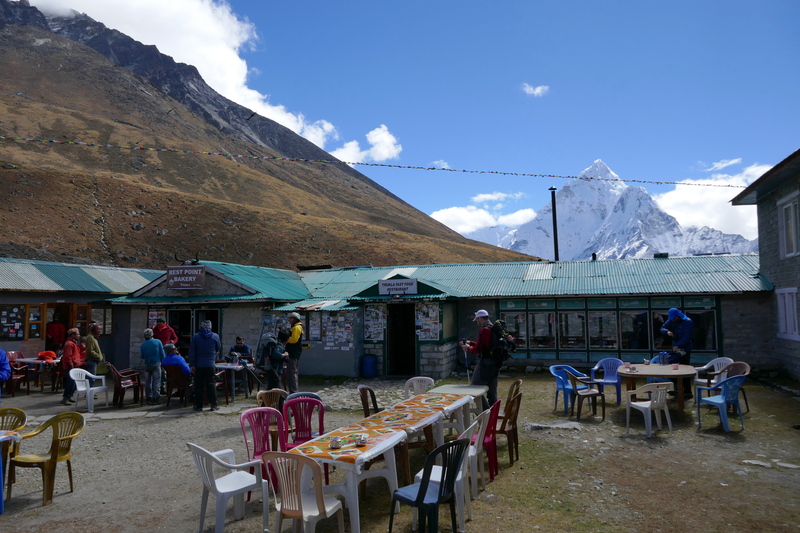 Lobuche is another small town before Gorakshep with a few teahouses for overnight stay. We stayed at Mother Earth Lodge, probably the best in town, exactly at 5000 m elevation touted as the world’s highest hotel on their website. All I wanted to do after checking into the Mother Earth Lodge was to crash out, tomorrow is a big day! never landed on such a beautifully crafted description of the journey.